It's time to Change the Conversation. Learn more about the impaired driving problem and Speak Your Mind to prevent deaths and injuries on our roads. Share what you're doing and what works with friends and communities across Canada to help others. three profiles were found for Changetheconversation.ca in social networks. Among other social networks the website is represented in Facebook, Twitter and YouTube. The web server with the IP-address 173.225.114.39 used by Changetheconversation.ca is owned by Webair Internet Development Company and is located in Garden City, USA. This web server runs a few other websites, mostly in the english language. 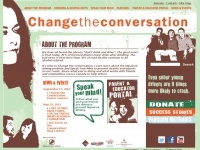 The websites of Changetheconversation.ca are hosted by a Apache server and were developed in the programming language PHP. The markup language of the website is XHTML 1.0 Transitional. The visitor analysis software Google Analytics is used to analyze the visitors of the websites. The website does not specify details about the inclusion of its content in search engines. For this reason the content will be included by search engines. The homepage of the website is "/about_the_program/home.php".